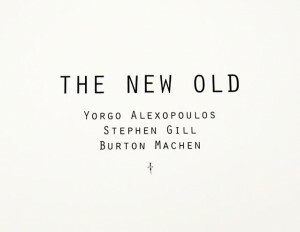 INVISIBLE-EXPORTS is pleased to present, The New Old, a group show featuring photographs by Yorgo Alexopoulos, Stephen Gill and Burton Machen. Photography is our most trustworthy medium; after decades in which artists have interrogated and undermined the sanctity of the photograph, we still take seriously its documentary capacity. Photographic images seem discrete, unchanging and inviolable, a portrait of an eternal present, like a time capsule. But even time capsules are transformed by time; they belong to the present as well as the past. The three photographers presented here each confront the power of agnostic forces external to the image to reshape and remake the work — and the medium — itself. Yorgo Alexopoulos’ snapshots from 1980s Los Angeles— from Venice Beach to Pasadena, Long Beach to the Valley — are portraits of an indigenous American culture, waylaid dispatches from a time and place both vanished and immanent—when the world of graffiti and skateboarding had a firm hold on local youth. His images are documents spontaneously conceived but hidden away for nearly two decades. Presenting the photographs today, Alexopoulos insists the viewer examine and recognize the world he’s captured rather than the individuals caught in the cross-section. Stephen Gill’s photographs of Hackney Wick, London, are, similarly, documentary objects pointedly manipulated and strategically abandoned to chance, images at once intentional and arbitrary. Gill buries the photographs in and around the neighborhood, varying the amount of time, positioning, and depth of each burial, allowing unpredictable natural elements to alter the image and initiating a collaboration of time and place, artist and environment, that generates work that is more unique object than simple photograph. Burton Machen uses borrowed and found portraits, pasting them on buildings and scaffolding in cities across America and Europe. Abandoning them for a time, Machen then returns to find the images altered not simply by chance and nature, but by the direct intervention of passersby and the natural metamorphosis of the urban environment. The work, like any good city, is collaborative but only half-planned, engaged simultaneously in self-effacement and self renewal. Yorgo Alexopoulos is a New York-based artist who has shown at Bronwyn Keenan, White Columns, and Raid Projects, among others. He is a graduate of the School of the Art Institute of Chicago and lives and works in New York City. Stephen Gill’s photographs have shown at galleries and museums across the globe, including London’s National Portrait Gallery, The Victoria and Albert Museum, Agnes B, Victoria Miro Gallery, Galerie Zur Stockeregg, Gun Gallery, The Photographers’ Gallery, Palais des Beaux Arts, Leighton House Museum, and Haus Der Kunst, among others. He is also founder of the publishing imprint Nobody. Burton Machen has been featured in Vogue, Harpers Bazaar, W, Entertainment Weekly and more recently, Angeleno Interiors. Originally from Ashville, Alabama, Burton has lived in New York, Washington DC, New Orleans, Atlanta, Rio de Janeiro and now makes Los Angeles his home.